A surfboard hangs outside one of the barns at Pie Ranch, and rightfully so—this 14-acre, pie-slice-shaped farm resides just five minutes from the coast. Whether or not the hardworking farmers and staff here find time (in between farming, youth outreach programs, potlucks, and barn dances) to use said surfboard is another question altogether. Either way, the juxtaposition of rugged California coastline to one side of the Camarillo Highway and verdant ranch land to the other side makes for one pretty picture. I recently went out to join in the farm’s monthly community work day, which takes place on the third Saturday of each month. Once at the ranch, I got some sustenance in the way of a basket of strawberries (freshly picked that morning) and a strawberry galette supplied by the bakery down the road, which makes a variety of tasty treats (many pies included) using ingredients from Pie Ranch. It’s also about “pie in the sky” thinking, with an aim of instilling social change and sustainability through healthy activity and outreach. As such, the working farm partners with educators and local enthusiasts to preserve agricultural practices and create a healthy haven and learning environment for the community. On the third Saturday of each month, Pie Ranch hosts “work parties,” when everyone who’s interested is invited to come out and get their hands dirty with some good old-fashioned farming fun. For my part, I did some compost-spreading and tilling around lemon trees. The compost was dry and grainy, with just a tinge of the funky smell you might expect from decomposed organic matter. Pitchfork in hand, I shared stories with an intern and other eager volunteers—who ranged from high school students to married couples—as I turned over the compost and dry dirt, the pain of my bent-over back hardly on my mind (although that would quickly change). 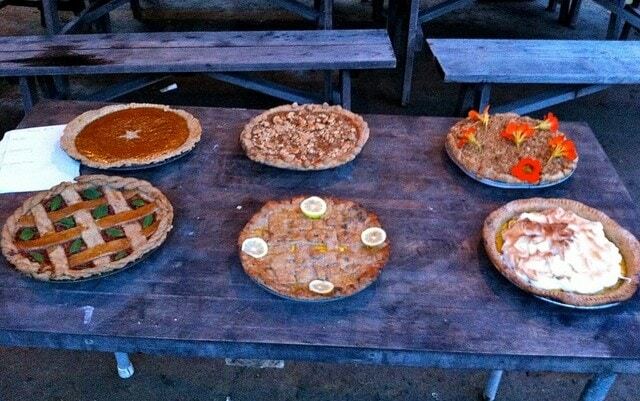 At Pie Ranch, they grow too many fruits and vegetables to name them all. There are the well-known, from raspberries and apples to rhubarb and wheat. And then there are the lesser known, like olallieberries and tayberries (a cross between a raspberry and blackberry). All are delicious, all are farmed sustainably, and all are put to good use—at the farm, the nearby bakery, and at other local eateries (like San Francisco’s own Mission Pie). I ended my work day by joining fellow “farmers” in grand feast and celebration. Work parties take place on the third Saturday of each month from 2-6 p.m., and after a hard day of beet thinning and chicken feeding, volunteers are invited to enjoy a delicious potluck, starting at 6 p.m. (bring dishes that can be shared with all, as well as your own plates, cups, and utensils). Then it’s time for the work-weary farmers to kick up their heels at a traditional barn dance with rollicking music from the farm’s own house band, the County Line Pickers. Caller Andy Wilson makes it easy for everyone from beginners to experienced two-steppers to join in the fun. The party runs from 7 p.m. until 10 p.m. and often attracts as many as 300 party-goers. Admission is a sliding scale of $7-20 or $5-10 if you volunteered during the day.